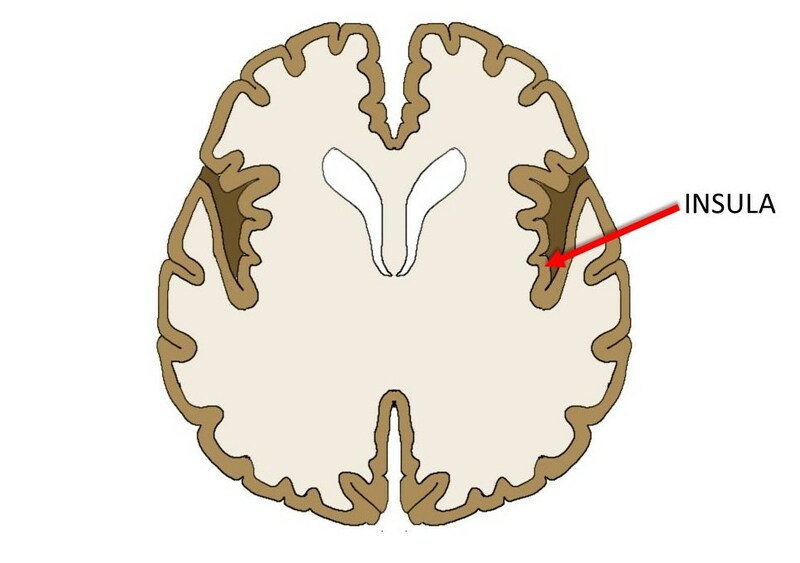 The insula is a small region of the cerebral cortex located deep within the lateral sulcus, which is a large fissure that separates the frontal and parietal lobes from the temporal lobe. What is the insula and what does it do? If you decided to write a term paper on the insula 20 years ago, it probably would have been a bad idea. First off, your teacher might have thought you were just trying to impress her by choosing an obscure area of the brain that even she knew nothing about. Second, you would have had a hard time even finding enough sources to write the paper with. Since the mid-1990s, however, this deeply-buried region of the brain has begun to garner much more attention. The insula is tucked away inside a prominent fissure of the brain called the lateral sulcus. Its concealment is one reason why it went mostly unnoticed for such a long time. But neuroimaging, along with studies involving patients with damage to the region, have helped us to recognize the insula as an area of the brain that seems to play a role in a number of everyday activities. However, the imprecision of neuroimaging and clinical studies have also led to vagueness about what exactly that role is. Indeed, the insula appears to be activated during a wide array of events. Depending on whom you ask, the insula is involved in pain, love, emotion, craving, addiction, the enjoyment of music, or even the tasting of wine. So, what is really going on here? The answer may be that the insula is at least partly responsible all of these seemingly disparate things because it facilitates our concept of self-awareness. This would include the awareness of our bodies and emotions, and how they interact to create our perception of the present moment. This sounds very metaphysical, and is only a hypothesis, but it would help to explain why the insula seems to be involved in such a diversity of thoughts and behaviors. The idea that the insula is involved in the formation of our present-moment awareness can be traced back to what is known as the somatic marker hypothesis. Put forth by Antonio Damasio in the 1990s, the somatic marker hypothesis suggests that people use bodily signals to help them make decisions (e.g. a queasiness in your stomach about walking down a dark side street at night might cause you to stick to the well-lit main street). Damasio suggested that the insula plays an important role in the processing of these bodily sensations so they may be used to influence decision making. The role of the insula in the somatic marker hypothesis was expanded upon by A.D. Craig, who has developed a hypothesis that the insula is the cornerstone of our overall awareness. Craig suggests that the insula constantly receives a heaping of information about the location and condition of our bodies, our subjective emotions, and the key features of our environment. It then incorporates the salient, or important, information into what Craig calls a “global emotional moment.” A global emotional moment is an image of ourselves at one point in time that includes all of the information that is important to us (e.g. I am happy, stimulated, yet hungry). It is the stringing together of these global emotional moments, according to Craig, that allows us to be subjectively aware of the present moment, and it all happens in the insula. Of course, one should take caution when attributing such a grand function like the generation of awareness to any one brain region. For now, the insula’s true role remains something of a mystery. It is activated by a wide variety of stimuli, but exactly why is unclear. It may be the cornerstone of our conscious awareness, or its function may be much more mundane. It has become a prominent part of neuroscience, however, which is quite an accomplishment for a brain region that was essentially unheard of a few decades ago.